During the latter part of Spring Training, we took a ride to Orlando and covered an exhibition game between the Detroit Tigers versus the Atlanta Braves at Disney's Wide World of Sports Complex. Through the years, there have been numerous broadcasting names that have been delivering thrilling moments for generations. In the business world there are four types of businesses: Small Businesses, Large Businesses, Corporations and Family Businesses. In baseball, the term Family Bloodlines run real thick. Not only as a player, but as a broadcaster. To name a few that stand out, there is the father and son tandem of Jack and Joe Buck, who had and have been fixtures with the St. Louis Cardinals. They both have worked on National Television while the late Jack also worked on National Radio and worked many sports. Joe has worked with other sports as well. Thom and father Marty Brennaman are currently working together with the Cincinnati Reds. Prior to arriving in Cincinnati, Thom worked with the Arizona Diamondbacks and also works for FOX Sports doing a variety of assignments. The next one intrigues me even more. I'm speaking about The Caray's. There is Harry, son Skip and grandson Chip. Yes, three generations. Chip is photographed. In December of 1997, the improbable nearly became a reality. Chip was hired to work with Harry on Chicago Cubs broadcasts on WGN TV. But on February 18, 1998, this never came to fruition as Harry died. Chip would continue to work seven seasons and left after 2004. Chip, 50, would move to Atlanta and followed his late father Skip's footsteps to broadcast Braves games, where he still is active. I had an opportunity to speak with Chip on some interesting topics in this Interview. Q: Compare and contrast Spring Training in Arizona where you worked with the Cubs, and Florida with the Braves. I see you have quite a tan. A: Both places were great. The distances for Arizona teams was very favorable. Not much travel time to play other teams, whereas the closest to the Braves is Kissimmee (Houston Astros) is 15 minutes away. The next closest is where the Detroit Tigers play in Lakeland which is 45 minutes. In both places the weather is hot. Arizona is dry and the ball carries more which is advantageous to hitters, less like the regular season except in Colorado. Florida is more humid and the ball is heavier. Hot hitters in Spring Training doesn't always correlate to regular season. Arizona is more luring for tax purposes. I like Florida because My family and I live here year-round, therefore, I can spend more time with my family between games. Q: You mentioned that the Braves travel a lot in Spring Training. Can you see them in Orlando over the long term? This is a beautiful complex. A: I'm not sure how much longer the Braves will be at this current site. I don't see them moving out of Florida. But I could see them moving to either coast of Florida. Q: This year MLB has instituted Pace of The Game Changes. What are your thoughts? These changes seem to be aimed between innings as well as hitter's time in the batters box. A: The big difference between Pace of The Game and Time of The Game is some games can have a fast pace and be 2.5 hours. Yet you can also have a fast pace of the game be 3.5 hours. What I'm saying is it's the "In Between Down Time" that we're trying to hurry up. In today's society, instant gratification with Social Media such as Twitter and Facebook, we're looking for more ways to attract the younger crowd.We really need the younger crowd as much of those that are say 55 years-old. Q: Chip, this has been a common topic and will be long after our conversation. Do you ever see the DH in the National League? A: I don't like it. Baseball was originally a nine person game. Pitchers hit. This is the true form of the game. The DH also takes away some of the strategies of the game from the managers such as the double switch, etc... Besides, The Players Union likes the DH and it does prolong careers for the veteran players. But I would say that a true fan of the game doesn't like it. Q: This year Detroit native John Smoltz is going to the Hall of Fame. Long term, he turned out to be a great acquisition by Atlanta from the Tigers at the 1987 trade deadline for Doyle Alexander. How happy are you for John? A: Smoltz is a great guy all around. Just like all the other Braves are happy for him. He's earned the honor and it's well deserved. Q: In two weeks, the All-Star Game will be held in Cincinnati, Ohio and Commissioner Rob Manfred is allowing Pete Rose to be a part of the festivities. It's the right thing to do since so much of the history of the game especially in Cincinnati centers around him. 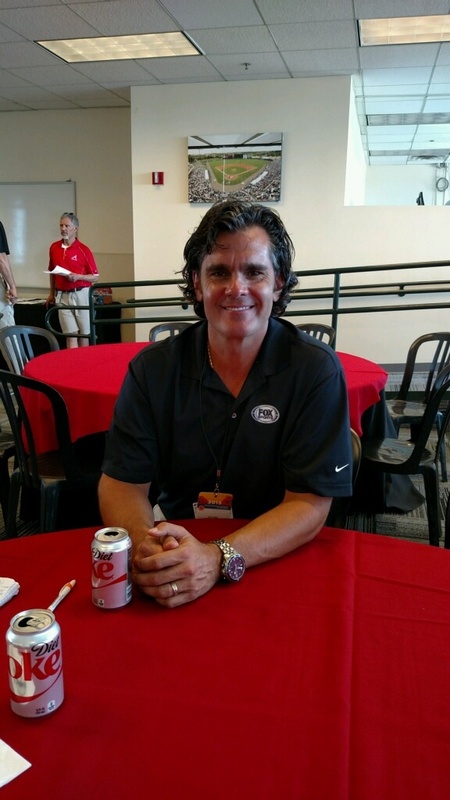 Chip, do you ever see Pete Rose ever being reinstated? A: If you go into any dugout/ locker-room, there are rules you don't break. It has nothing to do with drugs, alcohol and any other legal matter. It has to do with "No Betting On The Game." Pete broke that. For instance, he bet they would win 12 games in a row but not 13. Why? I wouldn't be surprised if he gets back in the game but not as a manager or anything else. Chip and I did address the Tigers a bit and he agreed that losing Max Scherzer would hurt a bit. With the Washington Nationals, Scherzer is 9-5 with a 1.79 ERA plus he already has tossed a no-hitter along with a pair of complete games. Detroit's difficulties this year have been as expected with bullpen issues and it has to get much better if the Tigers are going to return to the playoffs. But we're approaching the All-Star Break soon and the Tigers offense is the key down the stretch. I will be curious to see what moves are made in late July to see if indeed Detroit is a buyer or a seller. It wouldn't hurt to stay healthy. As of this post, the Tigers reside in third place in the AL Central and are currently 39-37, six games behind division leading Kansas City. Scott Morganroth can be reached at www.scottsports33.com and is a long-time member of the Detroit Sports Broadcasters Association.